Part of the appeal of any neighborhood bar is being in a spot where “everybody knows your name,” but as we discussed in a previous post, a little anonymity can go a long way sometimes. There are times when a man wants a little solitude; not too much, just an hour or so to sit in the dark, not be bothered, have a drink and be alone with his thoughts. It’s at times like these- these blessed, quiet hours, that you might find the Chop in Griffith’s Tavern with a cold draft and our phone turned off, hiding in plain sight. Griffith’s is truly the best of both worlds- the place where the bartender will learn your name and your drink, but where you’re guaranteed not to run into anyone you’d rather not run into. 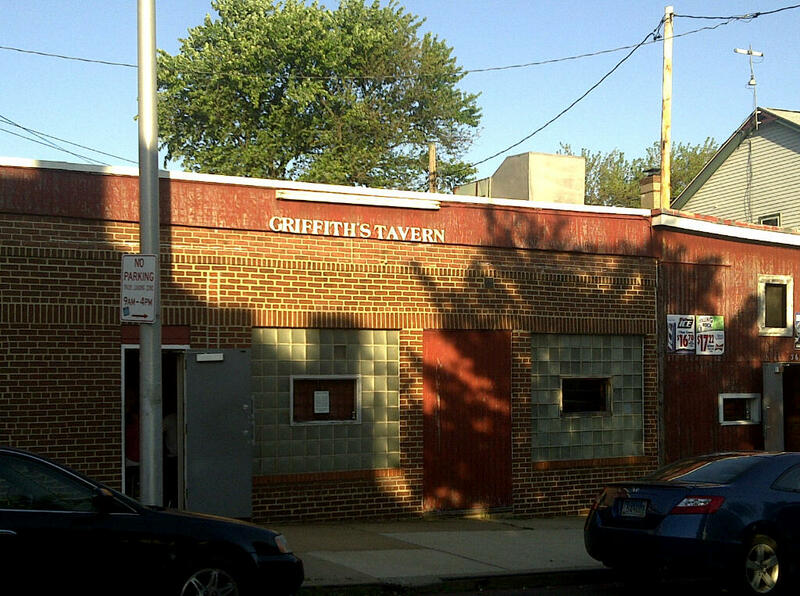 Griffith's Tavern... the bar that time forgot. In a way, hiding in plain sight is what Griffith’s does best. It sits there right on Hickory, just a block up from the Avenue smack in the dead-center of Hampden proper. It’s still pretty easy to miss though, being as non-descript as a bar can be. There’s comparatively little traffic passing that corner, and even some of the Hampden locals who pass the place on foot mistake it for being either a private club of some sort, or being closed down entirely. The small sign with business hours posted is the only clue that it’s actually a functional bar. Being attached to the back of a rowhouse, with solid steel doors and tiny, barred windows the place is willingly uninviting from the exterior. On the interior, it’s nothing less than the bar that time forgot. Stepping inside the door is literally like stepping back in time. Wood paneling is the predominant theme, accented by a nicotine-stained drop ceiling, an ancient, never-refinished wooden bar, and a Bud Light clock over the video poker machine which looks to date from about 1985. One flatscreen TV jammed up in the corner is the only nod to modernity. The flashback continues behind the bar, where you’ll see a few things that are tough to find in some bars these days; glass-door coolers with cans of Busch, pints and half pints of liquor for carry-out, snack food and a “medicine cabinet” stocked with singles of Tylenol, Advil, and Bayer, which come in handy in the kind of bar that opens at 9 am and has no food menu. There’s even an old coffee pot behind the bar. Of course, the regulars at Griffith’s don’t notice anything being out of date, because that’s just the way things have always been. Griffith’s caters to Hampden’s last genuine Hons. We’re not talking about the neck-tattooed, Newport-breath, recovery program ‘Hons’ you find in Zissimo’s or Dmitri’s either. Griffith’s is like the beauty parlor; the place your mom and your aunt get together to gossip about the neighbor’s kids. A $2.50 draft is cheaper than a perm. Much like a salon or a barbershop, the conversation here is general. Anyone can take the floor and put in their two cents at any time, and not be thought rude for doing so. Or you can just sit back and listen. You don’t even have to listen that long before you hear a few good digs at the expense of a certain Hampden restaurateur. Griffith’s may not be the best choice for Saturday night. It’s not the bar you pick to meet a friend for dinner. If you’re looking to flirt or meet someone, you’re definitely in the wrong place. But if what you seek is a cold beer and a peaceful hour, enjoyably spent then there may be no better bar in Baltimore. I’ve been going to Griffith’s for years as my secret getaway spot. This is exactly right. So, um, I just have to ask, why blog about it and tell everyone? This question has occurred to me, but I really don’t think it’s an issue. To be honest, I’m just not that influential. Griffith’s might sell 2 or three beers on the strength of this post, but that’s about it. My corps of readers is fairly small. 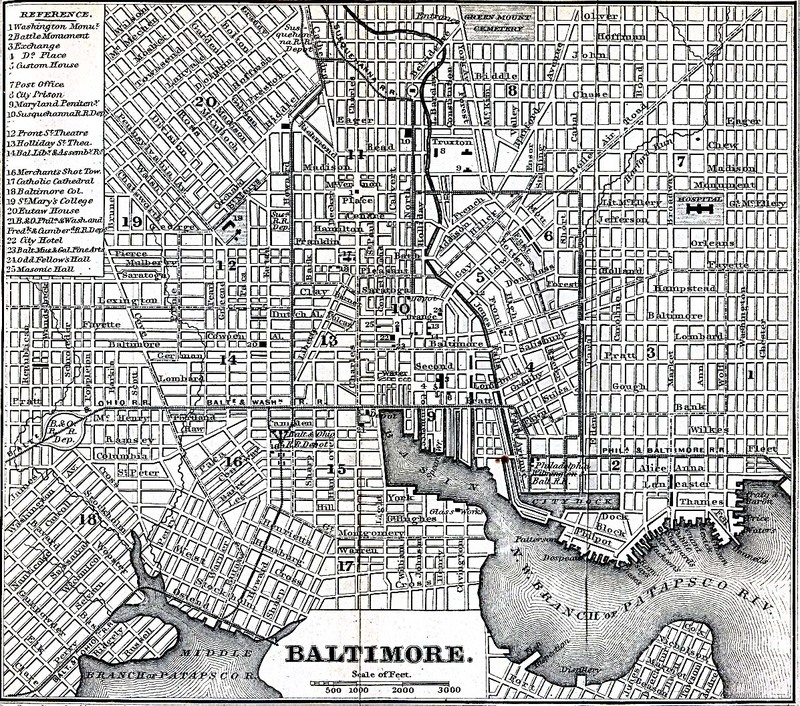 At the same time though, they’re pretty loyal, and for the most part, they’re the type of people who deserve to be in on the city’s best kept secrets (and let’s face it… in Baltimore all secrets are open secrets anyway). I *could* write yet another glowing review of B & O Brasserie or Blue Hill Tavern, but honestly, what good would that do anyone? I’ve always tried to make this blog about my own personal experience in the city, and the places I’ve highlighted are an extension of that. Besides, Griffith’s has a long way to go to supplant Long John’s as the street-cred cool kid dive bar of choice. I ask because I’ve wrestled with the same thing. I have a small handful of bars that I don’t talk to people about. That I don’t tell people about. They’re sort of private getaways for me and a couple friends. After evangelizing bars years ago, and seeing what happened to those bars (not that I was completely responsible, but I may have helped in some way), I kind of want to keep what I like about certain places pure. But at the same time, I wrestle with the compulsion to share my “discovery” so to speak. It’s tricky. You do a great job explaining Griffiths – I always felt like I was going into a friend’s basement to drink. The one drawback is they are more of a breakfast/lunch bar than an evening bar. There have been times where I’ve had to leave the Golden West Long Bar, for example, because of a show at like 11 to walk up to Griffiths only to find it closed. Part of the charm, though. I usually end up at Zissimos now – I’ve rediscovered the fun that is Zissimos. Me and a few friends have been talking about starting a Dive Bar Club, where we go overlooked bars once every couple weeks and check ’em out. That’s a good idea. It’s something I’d be interested in. The first rule of Dive Bar Club is that you don’t talk about Dive Bar Club. I first went to Griffiths about 2+ years ago, and recall the lady bartender there just being truly, genuinely friendly. Not like the “friendly” types that are just looking for a good tip, but she was happy to see someone under the age of 40 there. She introduced us to her husband, and even invited my friend and I to their weekly Ravens potluck that weekend. I didn’t go but really, really wish I had.